James Coplan, M.D., Neurodevelopmental Pediatrician, Author and Speaker » Blog Archive » In the clinic: First, do no harm. In the clinic: First, do no harm. In the Clinic. Today’s post launches another regular feature of my blog. The clinic is where “the rubber meets the road” – care of the individual patient, in the real world. Studies and statistics are important, but in the final analysis, everything comes down to the treatment of individual patients, one at a time. “In the Clinic” will be a potpourri of clinical experiences, clinical questions, and clinical pearls I have gathered over 30 years of practice. I have decided to inaugurate this column with a series of posts about the DSM-5. 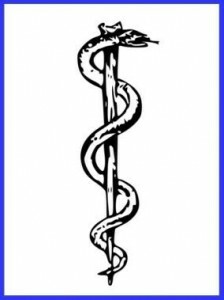 “Primum non nocere” – First, do no harm. This is the cardinal principal of Medicine, drummed into every medical student long before they touch their first patient. Hippocrates, the ancient Greek physician who gave us the Hippocratic Oath (“Whatever houses I may visit, I will come for the benefit of the sick…”), is often credited with this dictum as well, although the version that comes down to us across the centuries is in Latin, rather than Greek. Today we know more about the biology of health and disease than Hippocrates could have imagined. Nevertheless, the guiding principle “Do no harm” remains unshaken. Scientific analysis of the merits of any form of treatment always comes back to the “Risk-Benefit ratio”, i.e. what is the balance between the potential for doing harm, versus the potential for doing good? If you can’t be reasonably certain that the potential benefits accruing from intervening will outweigh the potential harm, then leave well enough alone. Don’t succumb to the temptation to “just do something.” You could make a difficult situation even worse. Unfortunately, the American Psychiatric Association may have abandoned this principle, at least insofar as its treatment of Autism Spectrum Disorder in the DSM-5 is concerned. I cannot say for sure that the changes in the DSM-5 actually will do harm. But there is ample evidence of their potential to do harm, and scant evidence of their potential to benefit children or adults with ASD. In the parlance of modern Medicine, the Risk:Benefit ratio does not lean in the direction of the DSM-5. “Harm,” in this instance, means pushing some people with ASD out of the boat (or, not letting them into the boat in the first place). We live in a society where – rightly or wrongly – services are tied to having a diagnosis. This tendency has become especially pronounced within the educational system, where huge sums of money are earmarked exclusively for children on the autism spectrum. Next time, we will begin to pick apart the specific attributes of the DSM-5 that are so problematic.